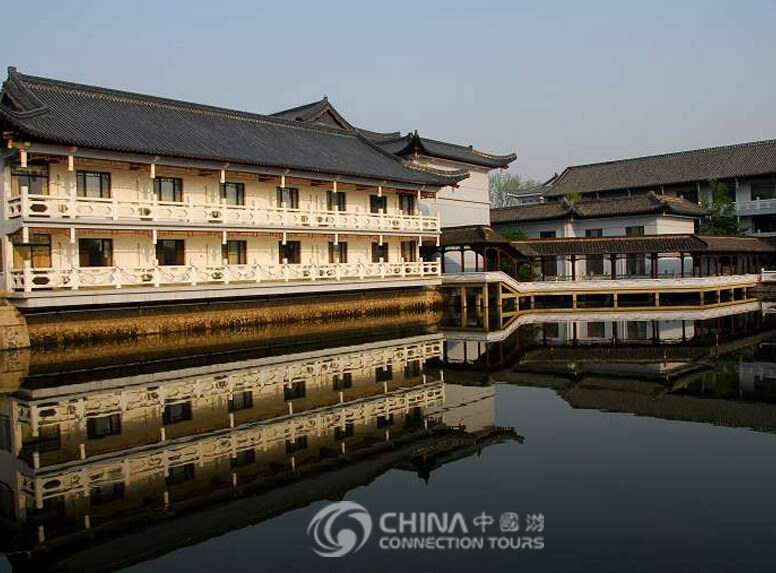 Shou Xi Hu, known as "Slender West Lake" is one of Yangzhou's largest and most striking sights. The graden's layout gave rise to its name - it runs along both sides of a remarkably slender lake which snakes through the north part of the city,. Connoisseurs of gardens admire it because it combines the elegant presentation and careful planning of a small garden with the landscape and scenery of a larger lake. Although now it is one of the most famous and admired gardens in China, it was once just a narrow river. During the 18th century, the Emperor Qianlong was planning a trip from Beijing to visit the cities of central China. Qianlong was a devoted tourist, interested in seeing all the attractions and historic places of the cities he visited. To win favor with the emperor, the wealthy salt merchants of Yangzhou decided their city needed a major new scenic spot before the imperial visit. They choose a winding river, widened it to make a long, narrow lake and added trees, gardens, pavilions, and pagodas alongside it. The garden is very convenient to visit since one end of it begins near downtown Yangzhou, and at the other end is the famous Daming Si, a large Buddhist temple complex and another of Yangzhou's major attractions, so a walk though the 3.4 km long garden is one of the most pleasant ways to travel between the city's sights. The vistas of the park are especially scenic with the large pagoda of the temple towering in the distance above the willows and pavilions of the garden. You can take boat tours through the length of the lake and watch the scenery and drooping willows float past, or rent a small boat and explore for yourself. Perhaps the most famous symbol of the park is its Five Pavilion Bridge. It is a wide bridge across one of the narrow parts of the lake, and is covered by a series of pavilions. There are two pavilions on each end, connected to a large central pavilion. Scholars of traditional architecture think this is one of the most striking bridges in China because it combines the monumental structure of a bridge with the lightness and elegance of the inter-linking pavilions. Set in the middle of the garden and surrounded by some of the park's most famous sights and views, the Five Pavilion Bridge is not only interesting to look at, but also a great place to admire the garden. Under the bridge's pavilions you can look out over the rippling lake and the willows and pavilions along the shores. Another famous spot in the garden is its White Dagoba, on a hill near the Five Pavilion Bridge. A dagoba is a type of Buddhist monument, which most closely resembles a huge bowling pin several stories tall. The park was originally designed without a dagoba, but it was built as part of another scheme by locals to impress the Emperor Qianlong during his visit to Yangzhou. During his visit to the garden, the emperor was impressed by what he saw, but commented that he thought the garden would be much more beautiful if it had a white dagoba like the one in his imperial palace in Beijing. The local salt merchants quickly decided this was a good way to get in the good graces of the emperor. They had men work all night long building a dagoba, so when the emperor took another boat trip through the garden the next day, the merchants pointed out the hazy outline of a dagoba through the morning mist, to the emperor's delight. But of course it was impossible to make a stone tower overnight, so the salt merchants had their workers use bags of salt to make the body of the dagoba, then cover them over with plaster. Once the emperor was safely back in Beijing, they replaced the makeshift tower with the more durable one that stands today.